We all have gotten them: the amaryllis bulbs that come in the little square box with the big bulb in a small pot, a baggie full of peat moss, and instructions which we are to follow. We take out the contents, read the instructions for planting and proceed to follow them. Which are simply: give it water and it will grow. It does not take long before it starts to grow, and grow and grow. Before too very long, it becomes hard to keep it upright in its little pot, but we somehow manage. It finally blooms--four (4) large, beautiful flowers that last a couple of weeks, and then begin to slowly fade away. Sometimes we get lucky and get a second flower stalk that produces a second flower, and it, too, fades away. 1. After your plant has stopped blooming, cut the flower stalk off and carefully remove the bulb from the little pot. Fill the pot with good potting soil so that 1/3 of the bulb will be above the soil line. Put it in a sunny window. 2. 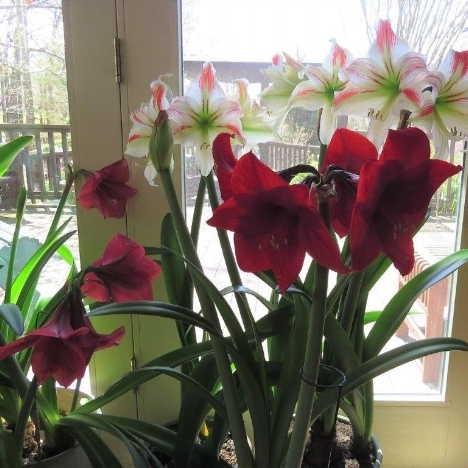 After danger of frost has passed, put your amaryllis outside in a shady area (or an area that receives only morning sun). Feed it with a slow-release fertilizer (like osmocote). 3. Let your amaryllis lounge outside all summer, watering as needed. 4. When fall frosts arrive, bring your amaryllis into a cool area like a garage or an outside workshop, and stop watering it. As the leaves wither and yellow, cut them off and discard them. The bulb should rest like this for about this for 2 months. 5. Late in December or early January (actually you can leave them out in the cool garage or workshop as long as you want if they have not started to sprout). Whenever you see new growth beginning, bring your plant into the house, water it once, and don't water it again until you see it start to grow and the process starts all over again. 6. Usually by the amaryllis's second summer outside, you will see a new shoot or two growing beside the main bulb. Let them grow in place and they will become blooming bulbs (just like their mother) and gradually fill your pot with flowers. 7. Repotting: amaryllis do not need to be repotted every year. Repot only when they become very crowded. This should be done during their dormant period. You can move the whole clump into a bigger pot or separate the bulbs into separate pots as you choose. 1. Remember to fertilize with slow release fertilizer each year when you move them outside. 2. Do not water during their rest. 3. If the bloom stalk gets really tall, be prepared to stake or tie them because they will flop over. 4. If a stalk should break or a flower broken off, then it will do beautifully in water. 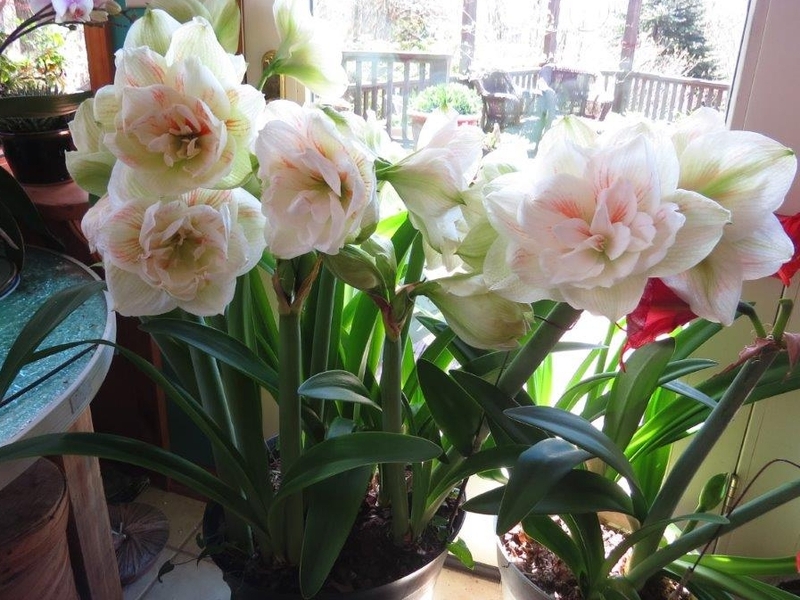 You don't have to buy amaryllis in the little square box from the "big box" store. There are dozens of real beauties out there. One to check out is www.johnscheepers.com. There are other, check them out.